Summit Sky Ranch is a community development of real estate properties for sale in Silverthorne, Colorado, bringing a new standard of living to the area. 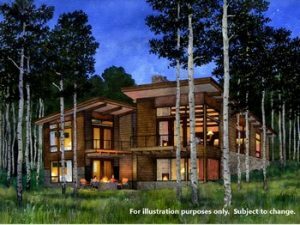 Perched on the mountainside surrounded by aspen groves and the Arapahoe National Forest, the thoughtful 240 Silverthorne single family homes offer multiple Mountain Modern home designs and lot options in a collection that will inspire architecture for decades to come. You can find Summit Sky Ranch in the Blue River Valley, just two miles north of the town of Silverthorne, where 416 pristine acres provide the perfect base camp for you and your family to explore all the four season outdoor activities the Colorado Mountains have to offer. When owners are not out exploring Colorado they will have all the comforts and finest amenities to provide their families outdoor experiences to treasure forever. The Aspen House will be central in the community and will serve as the social and recreational centerpiece. The Boat House will be set on Summit Sky Ranch’s lake with breathtaking views of the surrounding Mountains. Amenities include a private 20-acre lake and beach, an observatory, private Blue River fishing access, communal gathering areas offering yoga, a fitness center, hot tubs, fire pits and an outdoor swimming pool, and nearly unlimited access to the heart of the Colorado Rocky Mountains including multiple world-class ski resorts, biking and hiking trails. Silverthorne single family homes designs range from 3 to 5 bedrooms and homes and cabins start in the low $600’s. Flex bunk rooms and casita add-ons are also available. Home sites are available for custom building and start in the low $200’s. For more information on Summit Sky Ranch and available home sites and floorplans, please contact Justin & Krystal Knott with LIV Sotheby’s International Realty in Breckenridge, Colorado.